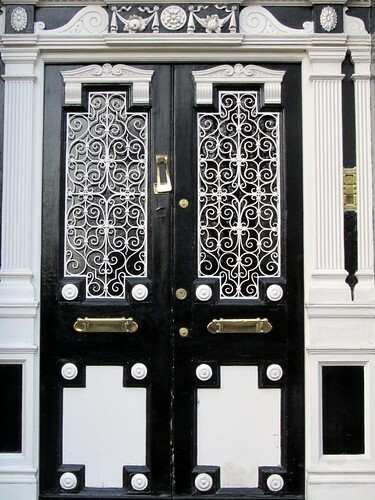 This black and white gem can be found at 46 Fitzwilliam Square and has been touted as the most photographed door of Dublin (well, the hop-on, hop-off bus tours love to show this off, so no surprise there). Now, here’s a little trivia I learnt from a friend – while it is the entry to a Georgian townhouse, the door itself is from the Edwardian period. Still, I think it still fits well into the old English feel. I managed to grab a few other shots of the more ornated doors to Georgian townhouses nearby and you can view them from this composite image at Flickr. The red and the maroon doors are both also located at Fitzwilliam Square, whereas the blue door is located at Merrion Square. The majority of the Georgian doors, however, are less flamboyant than these but no less colourful and interesting in their own rights. There are many features to combine to make each door unique, including the colours of the doors (normally single colour per door set), the flanking pilasters (usually with doric or ionic capital), the entablatures (from simple to elaborated) and the fanlight transoms (may be plain, may be frosted, may be stained).